TB / Bovine Tuberculosis (bTB) in cattle is caused by the Mycobacterium bovis (M. bovis) bacterium which is a zoonotic disease capable of causing tuberculosis in humans. The M. bovis bacterium is killed in sunlight but can survive in wide-ranging acids and alkalis and can remain viable in warm and moist soils for some time. The bacterium is thought to survive between one and eight weeks in cattle faeces. Several wild mammal species have been found to be infected, with particularly high rates detected in badgers. The scientific opinion suggests that badgers play a significant part in the rates of infection in cattle. A study (White et al., 1993), also found a relationship between the risks posed by badgers and the landscape of the south-west of England where incidences of TB appear to be highest. Animals under stress or which are poorly nourished have been found to be most susceptible to TB, with young cows and growing heifers most at risk. Evidence suggests that dairy farms with more intensive stocking rates are at higher risk of the disease. The bacterium can be spread in a number of ways by infected animals, through their milk, breath, lesions, urine, faeces and saliva. Infected animals generally start excreting M. bovis around 87 days from infection. A study (Costello et al., 1998) found that once in a herd, infection is most likely to be spread by inhalation. As the UK has a robust TB testing regime, advanced symptoms are rarely seen as the testing detects the presence of disease in an animal before it develops. 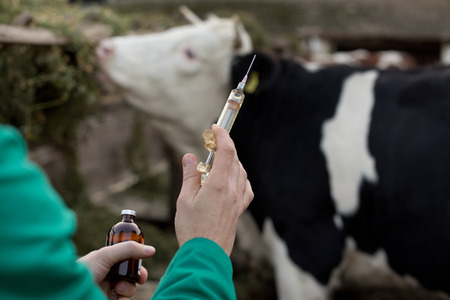 However, the first signs of TB & Bovine Tuberculosis in cattle is the presence of a cough which gradually becomes more persistent, leading to laboured breathing. This is caused by lesions developing in the lungs and the reason for animals coughing blood as the disease develops. It leads to animals losing condition and becoming lethargic, and if lesions appear in the udder, milk production can become affected with milk turning bluish in colour. bTB is a notifiable disease and as such, if it is suspected or actually proved, it must be reported to the Animals and Plant Health Agency (APHA). The UK operates an active surveillance for the disease which involves routine testing of animals thought to be clinically normal. The test is the single intradermal comparative cervical tuberculin skin test (SICCT). The testing frequency may differ between Scotland, Wales and England depending on the disease situation at any given time. bTB control relies on the timely and accurate detection of the disease with the prompt removal of any infected animals. Any animals affected by bTB must be culled, with restrictions then put in place on the affected farm preventing animal movements on or off the premises except under licence for slaughter. Establishing a closed herd can be instrumental in preventing TB & Bovine Tuberculosis appearing in a herd. This will involve breeding internal replacements as buying in animals poses a risk. This also means ensuring that cattle from neighbouring farms cannot enter premises via poorly maintained fencing, or nose to nose contact at the farm gate from passing animals. Biosecurity should be of a high standard and maintained at all times. Shared livestock carriers should be disinfected after use and people and vehicles entering the farm should pass over a biosecurity barrier to prevent infected material being brought in and spreading TB & Bovine Tuberculosis. Subscribe for updates & offers! Bovine genetics has much changed? Do you know the quality of the genetics you are using?